References: 1 U.S. Maritime Administration web site (Resources – Maritime Statistics). The Strom Thurmond Institute (1998). 3 U.S. House of Representatives, Comm. on Armed Services, Subcomm. on Seapow- tional registries can be addressed and reduced, but it heavy equipment.” The United States was fortunate er and Projection Forces, Hearing on Sealift Force Assessment (July 30, 2014). Impelled Cargo on the U.S. Merchant Marine at 49.
of a national registry. No amount of ef? ciency is go- tions and that the vessels were available for charter. 5 U.S. House of Representatives, Comm. on Agriculture, Subcomm. on Livestock ing to reduce the wages of quali? ed U.S. citizen mari- That might not be the case the next time. For ex- and Foreign Agriculture and Comm. on Transportation and Infrastructure, Subcomm. on Coast Guard and Maritime Transportation, Hearing on Food Aid Transportation (Nov. ners to a world scale level in the present day economy. ample, more of the world’s commercial ? eet has come 17, 2015). Naval Postgraduate School (Sept. 1979) at 29. College Review (Autumn 1993) at 50. 8 46 U.S.C. § 50101; 50 U.S.C. § 4401.
foreign market or a U.S. Government-owned ? eet. world’s ? eet in terms of deadweight tonnage (a mea- 9 U.S. Senate, Comm. on Commerce, Hearing on Establishment of an American Mer- chant Marine (Feb. 7, 1920) at 1011.
sure of carrying capacity) as of December 31, 1991 and 10 E.g., Statement of Gen. Paul J. Selva, Commander, U.S. Transportation Command to the U.S. Senate Armed Services Comm. (March 19, 2015). Submitted to the U.S. Maritime Administration (July 2009) at 45. Although the context has changed over time, the U.S.-owned vessels registered under foreign ? ag 12 John Jay (Secretary of Foreign Affairs) to John Adams, November 1, 1785, in Cor- question about whether to have an intrinsic American consisted of about three percent of the world’s ? eet by respondence and Public Papers at 175. Brookings Institution (1966) at 33-34. 14 James R. Reckner, Teddy Roosevelt’s Great White Fleet, Naval Institute Press ing no loyalty to the United States has not changed. offer some comfort since many, if not most, of these (1988) at 104-105. Strategic Sealift,” Naval War College Review (Spring 1991) at 16.
federal government: “Whether it would be more wise the requisitioning of such vessels by the U.S. Govern- 17 Andrew E. Gibson, “After the Storm” Naval War College Review (Summer 1992) at 22.
in the United States to withdraw their Attention from ment in the event of a national emergency – referred to 18 UN Conference on Trade and Development, Review of Maritime Transport 1991 and 2015.
the Sea, and Permit Foreigners to fetch and Carry for as the “Effective U.S.-Controlled Shipping Fleet.” Al- 19 Lawrence, United States Merchant Shipping Policies and Politics at 39-40. 20 Harlow, “An Analysis of the National Defense Reserve Fleet” at 29. Reserve Fleet is No Longer Needed (Oct. 1991) at 3, 8. Seapower and Projection Forces, Hearing on Logistics and Sealift Force Requirements and Force Structure Assessment (July 30, 2014) at 42.
late 19th and early 20th centuries about what it meant reliability is suspect even with U.S. ownership and, in 23 Id. at 8. 24 Gibson & Shuford, “Desert Shield and Strategic Sealift” at 12-14.
for the projection of sea power to rely on foreigners to any event, do not provide employment for U.S. citizen 25 Harlow, “An Analysis of the National Defense Reserve Fleet” at 27. 26 U.S. Maritime Administration, A Report to Congress Impacts of Reductions in “fetch and carry” for the U.S. Government. Admiral mariners needed to man Government-owned vessels. Impelled Cargo; U.S. House of Representatives, Hearing on Food Aid Transportation. This is Part 1 of a two part series. 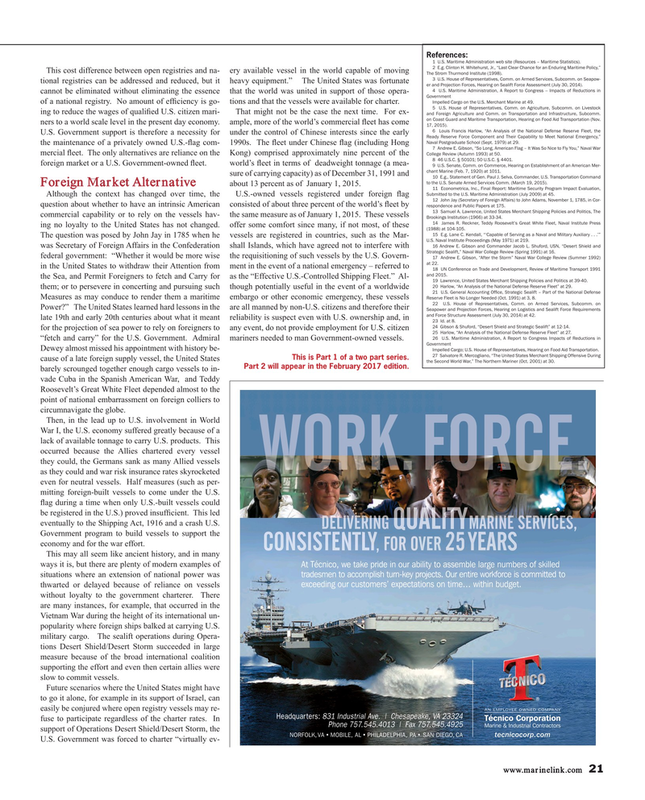 cause of a late foreign supply vessel, the United States the Second World War,” The Northern Mariner (Oct. 2001) at 30. Part 2 will appear in the February 2017 edition. Roosevelt’s Great White Fleet depended almost to the point of national embarrassment on foreign colliers to circumnavigate the globe. War I, the U.S. economy suffered greatly because of a lack of available tonnage to carry U.S. products. This occurred because the Allies chartered every vessel they could, the Germans sank as many Allied vessels as they could and war risk insurance rates skyrocketed even for neutral vessels. Half measures (such as per- mitting foreign-built vessels to come under the U.S. ? ag during a time when only U.S.-built vessels could be registered in the U.S.) proved insuf? cient. This led eventually to the Shipping Act, 1916 and a crash U.S.
Government program to build vessels to support the economy and for the war effort. At Técnico, we take pride in our ability to assemble large numbers of skilled situations where an extension of national power was tradesmen to accomplish turn-key projects. Our entire workforce is committed to exceeding our customers’ expectations on time… within budget. Vietnam War during the height of its international un- popularity where foreign ships balked at carrying U.S. military cargo. The sealift operations during Opera- tions Desert Shield/Desert Storm succeeded in large measure because of the broad international coalition supporting the effort and even then certain allies were slow to commit vessels.